I feel like this Christmas season started early for us. We started our shopping in October and saw a sky diving Santa in November. We were ready to get E’s first Christmas started! The sky diving Santa and elves were way more awesome than we expected. There was a huge crowd waiting when we arrived and a big X on the ground were Santa was going to land. 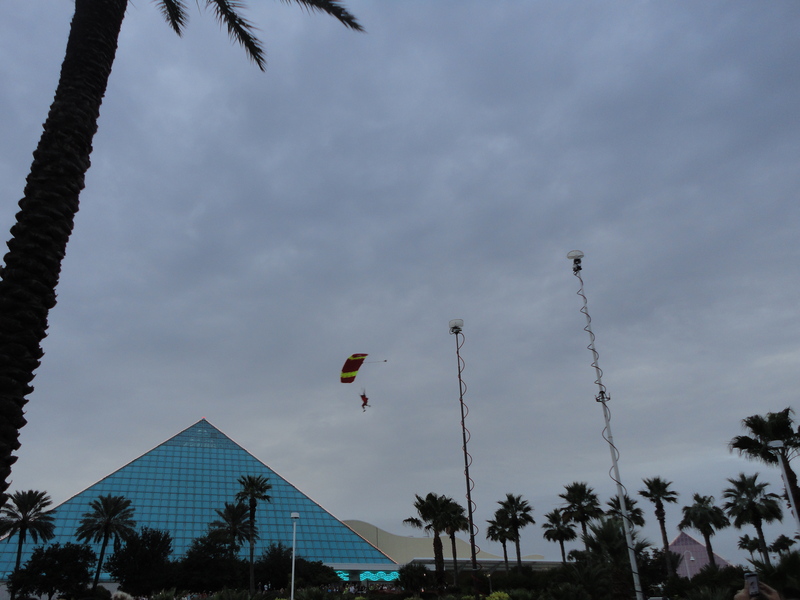 A live band played Christmas music and we were told than when we heard “Santa Claus is Coming to Town”, we would see Santa jump from a plane that was circling above our heads. Santa and his two elves were obviously professional sky divers because they came swooping in for quick landings, doing flips and turns in the air along the way. 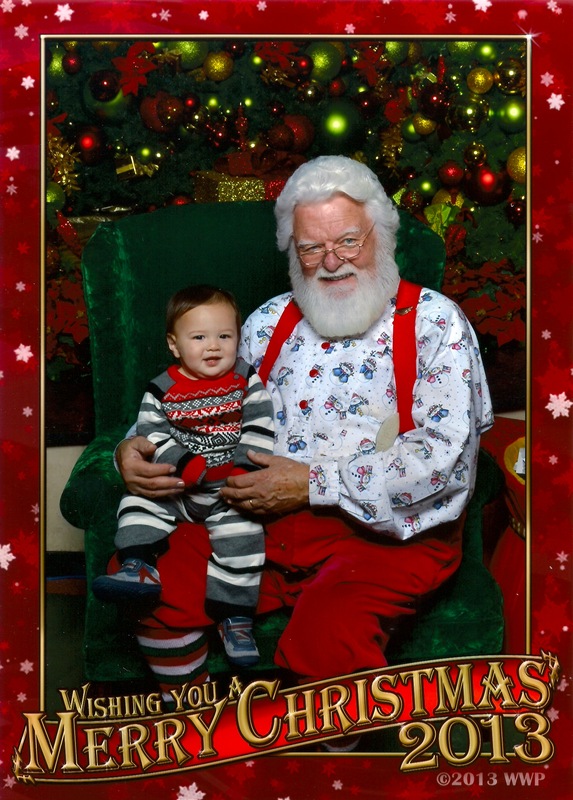 We took E to get a professional photo taken with Santa the Monday before Thanksgiving. Santa appears at the mall some time in early November and has crazy lines from Black Friday to Christmas. It was kind of spur of the moment, but as soon as he woke up from his afternoon nap that day, we dressed him, gave him milk, and drove to the mall. There was no one waiting for Santa, so we walked right up and sat him in his lap. He didn’t cry! In fact, he was mesmerized by Santa’s beard. We got a great photo, and were able to take our time, picking out what kind of prints we wanted, since there were no other customers waiting behind us. 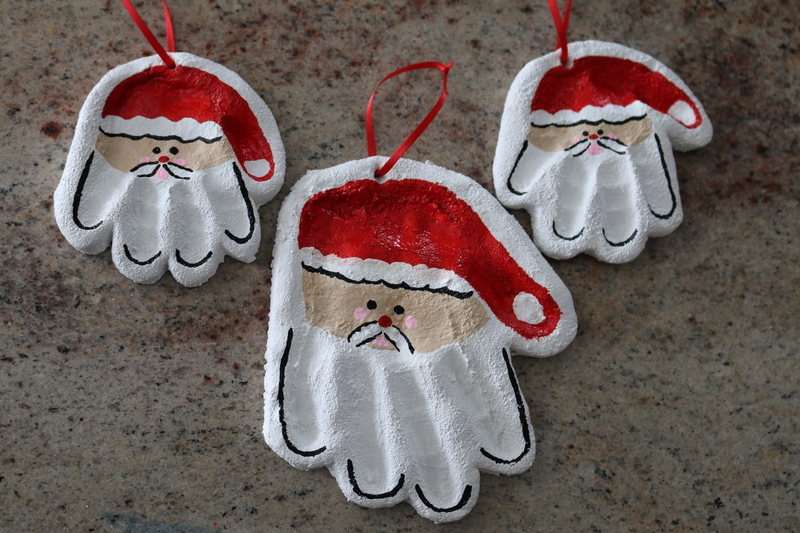 My mom found the idea for these hand print Santa ornaments online and we decided to try it out. 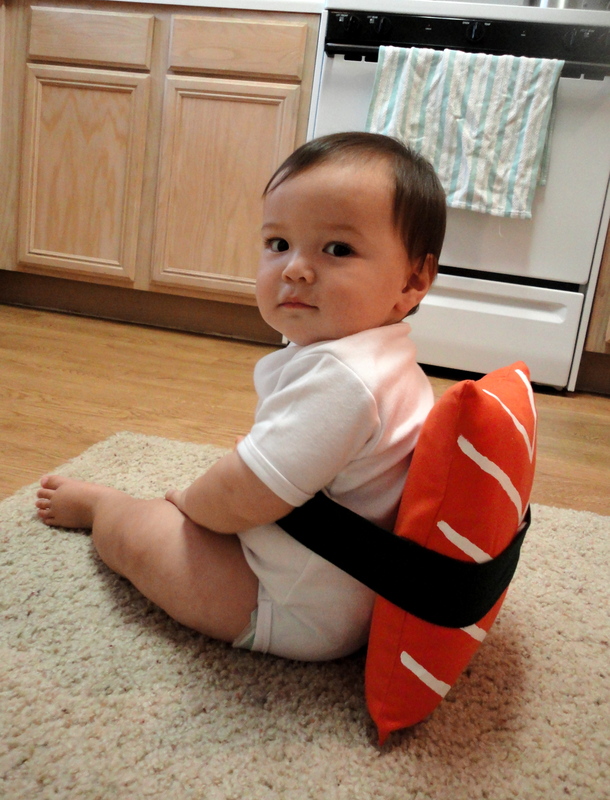 We thought it would make a cute gift for his grandparents in Japan. I believe the dough was made from flour, water, and salt and then once we got E’s hand prints and one from my nephew, we just cut them out, added a hole for the string, and baked them all afternoon on low heat in the oven. The following week we painted them and then put a sprayed them clear for shine. I think they turned out great! 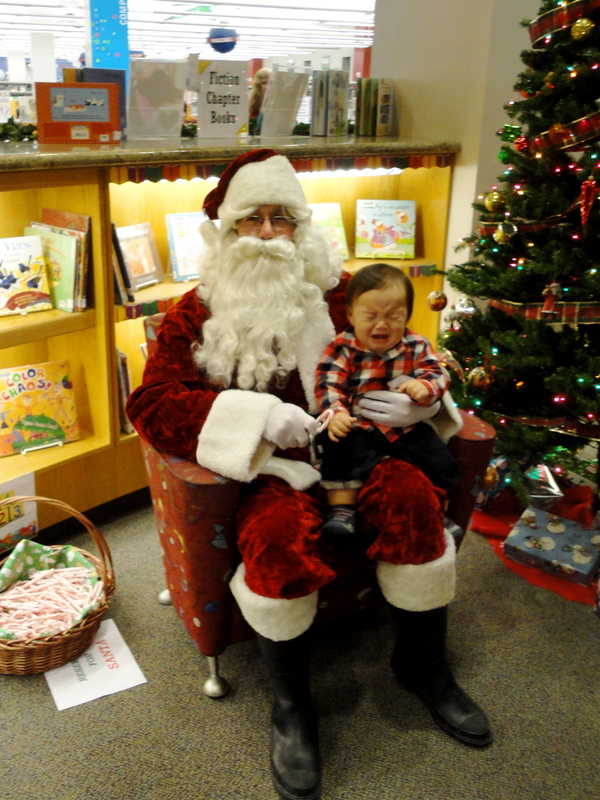 In early December, Santa was coming to our local library that we visit each week, so we thought we’d try meeting Santa one more time before Christmas. This time we had to wait 30 minutes, and by the time we got to the front of the line, E was antsy because it was just an hour before bedtime. I don’t think he was afraid of Santa, just tired. I should’ve known that we wouldn’t get lucky twice, but a first Christmas isn’t complete without your baby crying on Santa’s lap, right? I have a feeling that Santa will definitely be scary next year…. 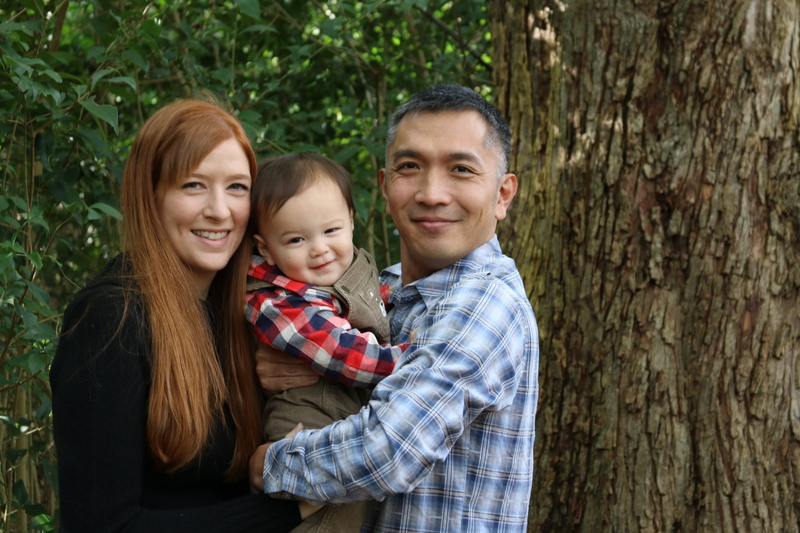 My mom got a fancy, new camera so she took our Christmas card photo this year. 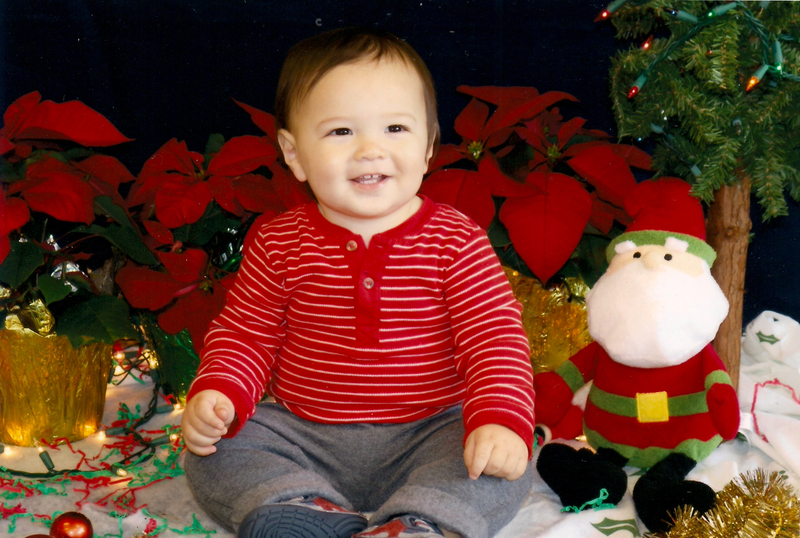 She’s also captured some great Christmas photos of E that we are thankful to have, including the one at the top of this post. It’s also the season for sick babies. E and my husband are both getting over colds at the moment and I’m doing my best to not catch it too. I think we’ve been pretty lucky so far though, because many other new moms I know have had babies suffering through multiple colds, strep, and the flu recently. E’s never had a fever or anything bad enough to mess with his sleep cycles (thank goodness!) Let’s hope he finishes out his first year healthy!